Summary: Create volume and style your hair easily and quickly with the Bumpits. 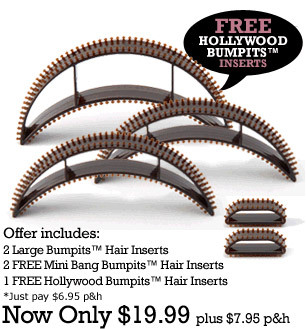 Get extra bumpits with your purchase today. Flat hair is so last year. Imagine being able to create volume in your hair instantly. Bumpits give you volume and style immediately. It gives you confidence and makes you feel beautiful. It's so easy to use but yet looks like you came out of the salon. Create dozen of styles with Bumpits. Wear it anywhere and for any activity. Will the Bumpit blend with any hair color? What colors are available? Yes, when you style as directed, the Bumpit will blend with any hair color without being seen. Everyone will notice you are having a Happy Hair day, but no one will know your secret. Bumpits comes in light blonde, medium/dark blonde, brunette/auburn/ and black to color match any shade. Will Bumpits Stay in my hair all day no matter what the style? What hold Bumpits in the hair so securely? Yes, if you style as directed Bumpits will stay firmly in your hair unless you remove it. The raised patented edging firmly grips any hair type. It's advise that ladies with finer, thinner hair do some light teasing at the base to ensure a firm hold. Can Bumpits be worn doing any activities? Yes! People have rocked the Bumpit dancing, working out, during work, shopping, and at formal events. Bumpits has never let them down.